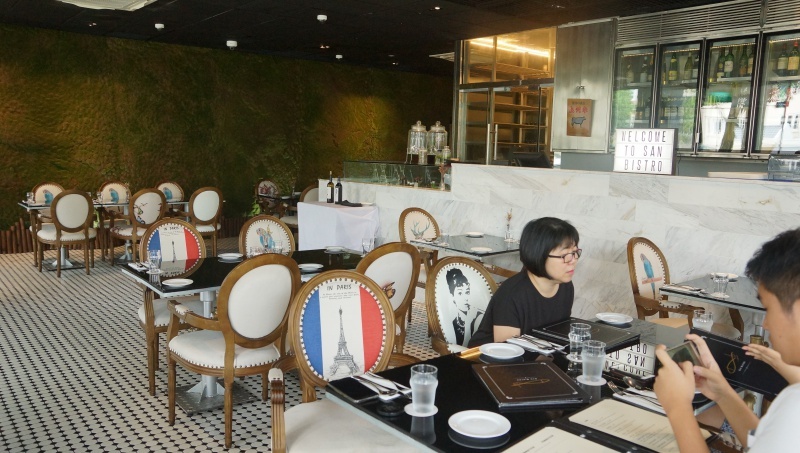 San Bistro adopts a European fine-dining setting with elegant French and Italian cuisine on the menu, the environment showcases a high-end dining ambience. One may find confusing aspects to the posh theme, to address one of it, the dress code. The restaurant does not require customers to dress formally, so visit in Bermuda? Shorts? Sandals? T-shirt? Don’t worry, all are welcome here, do we bother? Honestly, we don’t really care, good food comes first. The culinary skills from the chef is evident from the aesthetically-pleasing plating and the quality food served. 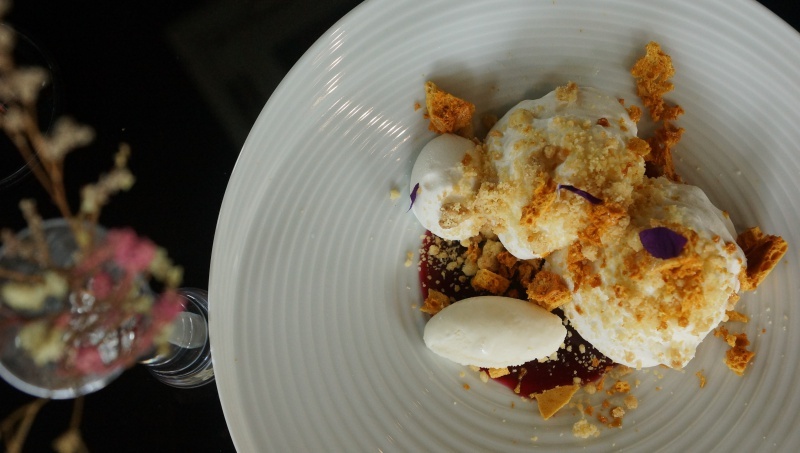 The chef used to work in a top-notch restaurant at Marina Bay Sands, and we are glad he brought fine-dining a step closer to the heartlanders into this casual place. The flavour was not memorable enough, we were hardly impressed. 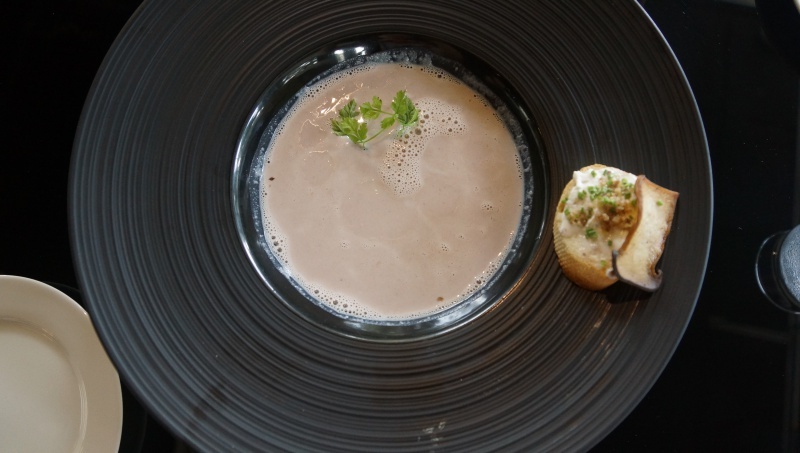 We were delighted to discover how tantalising the dish was. 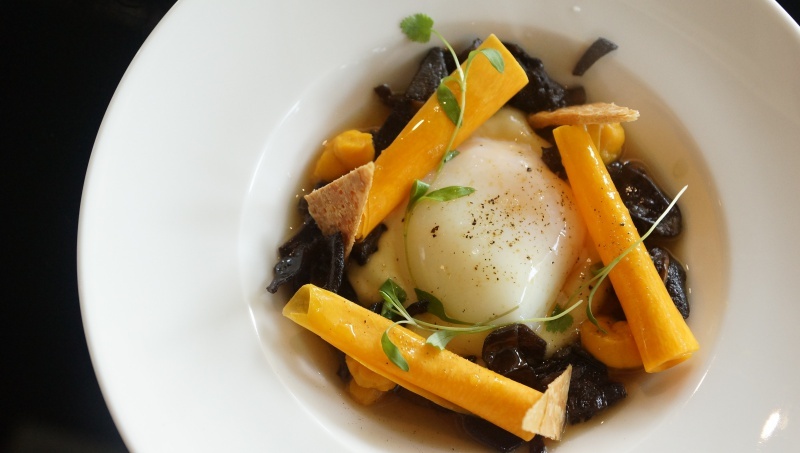 The egg confit blended perfectly with the truffle pomme puree and the mushroom. A starter highly recommended here. 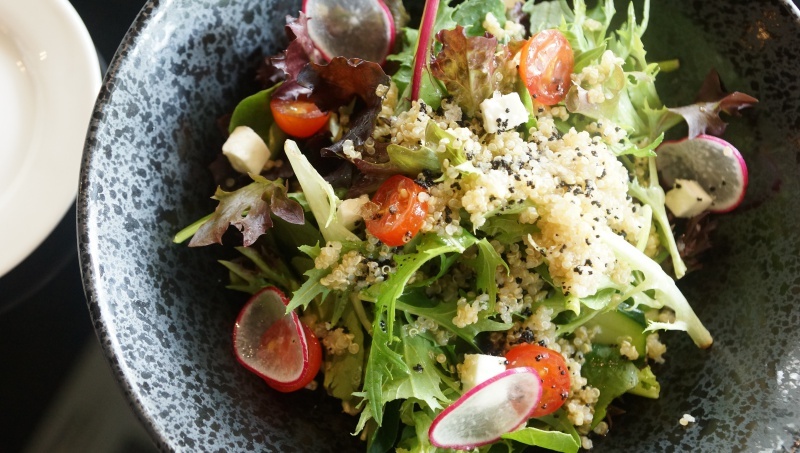 Freshness was everything for this good traditional greek salad, enhanced with feta cheese and oliver soil, healthy starter to start the meal. 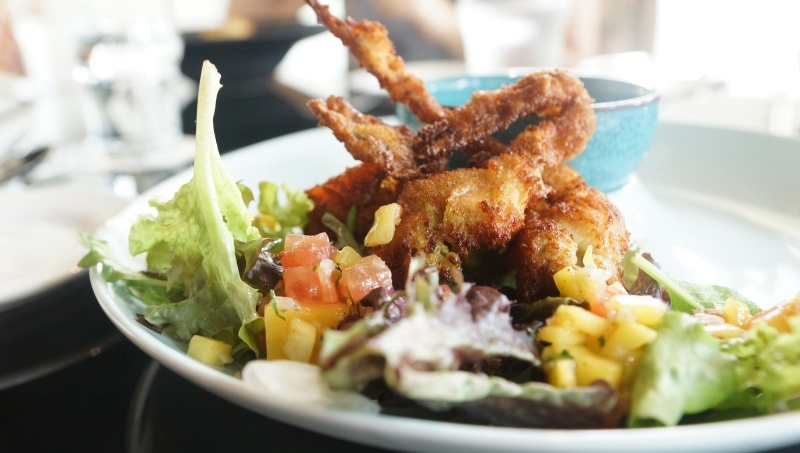 Portion of soft shell crab may be small but we have to agree the battered crab was extremely appetizing. The mildly-flavoured salted egg dip provided an extra kick, mango salsa and pickled salad as the side worked well. Not the usual monotonous sweet dessert, the chef has added the savoury taste from the salted milk sorbet to savour the different flavours. Hibiscus jelly added another dimension to the flavour, making it a dessert loved by all of us. 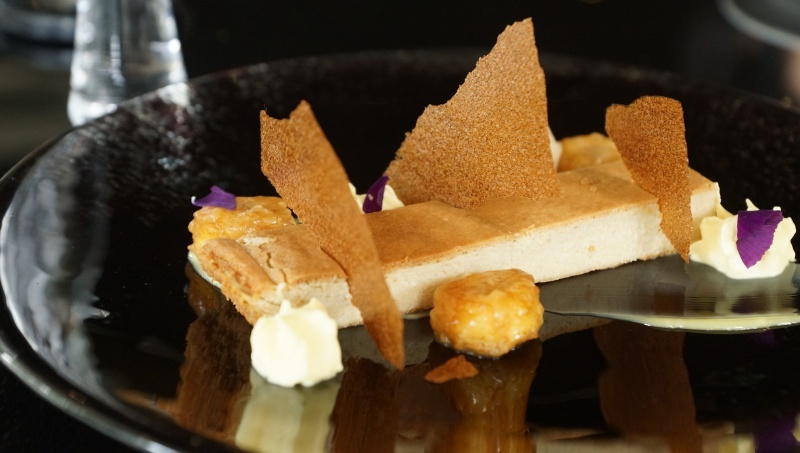 Banana cheese cake was moist, fragrant and fine, and complemented the beautifully-caramelised banana, balanced by the earl grey ice cream. Worth a try. 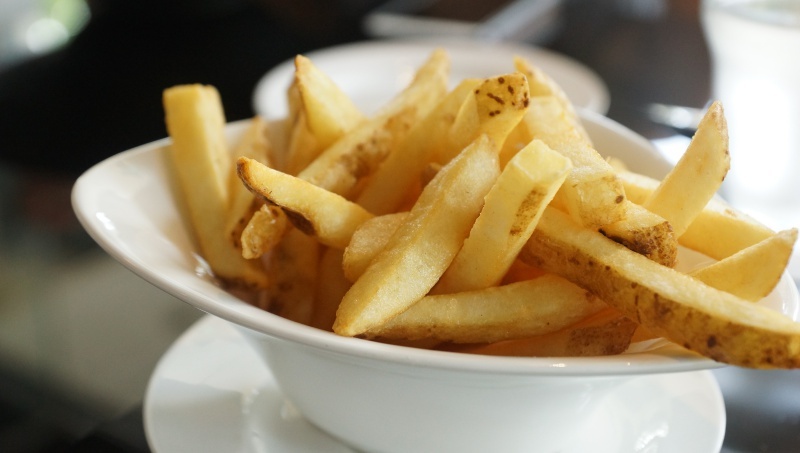 The thinly-coated batter fries was crispy and full of fragrance from the quality potatoes. So addictive that one serving is hardly enough. 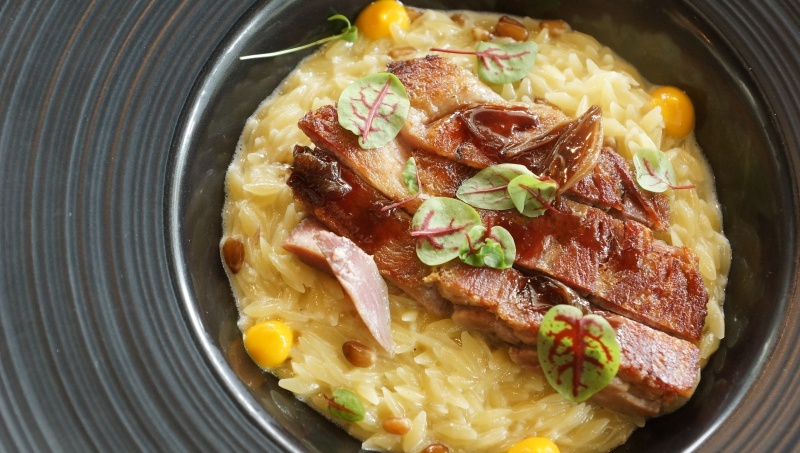 The duck confit was perfectly done with the crisp skin and tender moist meat, risoni pasta was nicely infused with the right level of butter and everything worked wonders in the bowl. 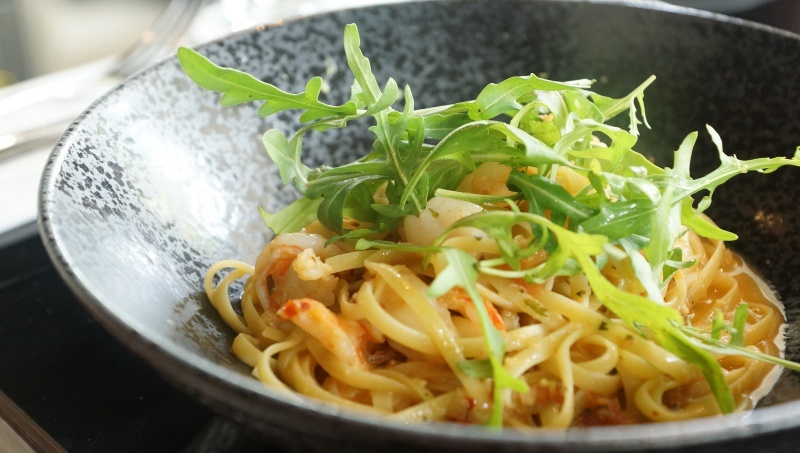 The linguine was al dente with a flavourful touch, tiger prawns may be small and a little overcooked but it has not compromised too much the overall standard. A truly delectable dish. 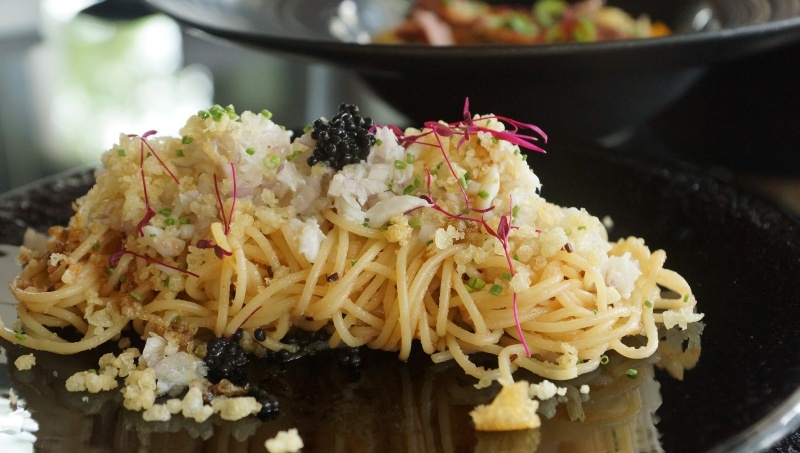 Different from the usual spice-infused dishes, this classic Italian flavour was given the extra punch with Asian flavour, by adding Japanese Mentaiko and tempura crisps with shoyu to complete this lip-smacking dish. San Bistro undoubtedly has the capability to deliver fine cuisine. This is the place you can enjoy good quality food without paying the exorbitant price compared to the downtown posh and chic fine dining places. And…you can dine with ease in your most comfortable outing dress.